The whole time I was listening to Pleather I thought to myself, "Who the hell does this guy's voice sound like?" Then it smacked me upside the head with a revolting thud: David Coverdale. 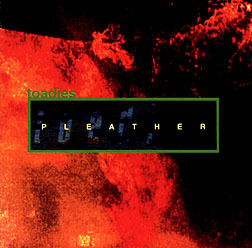 Toadies' Todd Lewis sounds like the mummified lead singer from hair farmer band Whitesnake -- albeit a spazzed-up, freaked-out version! Once you get past this awful revelation, however, you can feel free to enjoy Toadies' brand of heaviosity. Which includes... Lisa Umbarger's bass playing, which is kinetic, and her staccato lines forcefully pin these tunes down, especially on the driving "Got a Heart." Drummer Mark Reznicek speeds along, hitting his drums really hard, and the guitars of Charles Mooney III and Darrel Herbert range from grunge-o-delic cuisinart to all-out metal overdrive. Put all these elements together, and you have yet another heavy band vying for your heavy dollar... but you have to get by the vocals, first.